Tetra Engineering will be presenting our technical paper on "Impact of Startup Purge Credit on Combined Cycle Plant Operation" at the ASME Power and Energy Conversion 2015 Conference in San Diego, California, USA on June 30, 2015. It describes the technical basis for purge credit operation and provides an example of the impact on fatigue lifetime in key Heat Recovery Steam Generator components. See the full program at the ASME website here. on 19 April 2015 . ASME B31.1 places practice requirements on Operators for the maintenance of their Covered Piping Systems (CPSs). Condition Assessments are required on a regular basis, associated with good record-keeping for traceability. Over time this generates large volumes of documentation and inspection history data, therefore a coherent solution to knowledge management is needed. The software stores hanger/support setting information (hot/cold), inspection notes, photos, NDT data and associated design documentation (PDF drawings & manuals) in a simple and categorized manner, with 3D-visualization of all components. The user can add new data and save to a networked database, where it will be instantly accessible for other users. 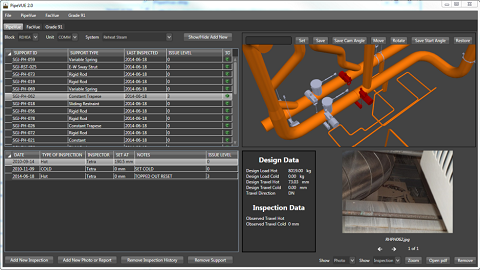 The software is available as a deliverable from Piping Inspections, or independently as a Knowledge Management System for Power Piping. Engineering support from Tetra is available as an option, creating an instant channel between plant personnel and third party engineers. on 17 September 2014 . Tetra Engineering will have a booth next month at the upcoming PowerGen Middle East in Abu Dhabi on October 12-14. We will present our latest service offerings including Field Services, Engineering Analysis, 3rd Party Engineering, and Training. Come see us at the N21 booth, and enter your business card for your chance to win a Wilesco Steam Engine Generator! Announcing Tetra Engineering's Fall 2014 USA Training Seminar: Effective Operation of HRSGs on November 12 & 13 at The Simsbury Inn, Simsbury, Connecticut USA. See this link for more information on the syllabus. 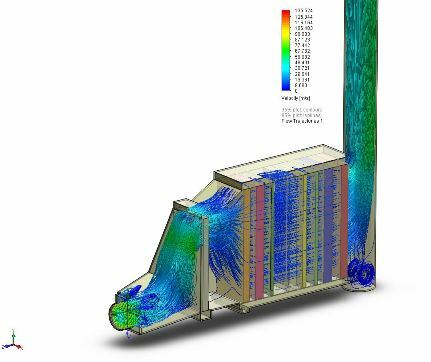 Tetra Engineering provides a full-scope service for the modelling and operation analysis of all types of natural or forced circulation Power Boiler and HRSGs, including supercritical and once-through designs. This can be integrated into a full plant model to incorporate the steam turbine and steam cycle balance of plant. on 01 September 2014 . Flow-Accelerated Corrosion (FAC) or Erosions-Corrosion remains a common cause of failure in HRSGs and conventional boilers, yet the underlying causes and solutions have been well understood for more than 25 years. The two factors influencing the susceptibility to FAC are: a) Unit Design and b) Process Conditions. It is important to know how FAC-prone your HRSG or boiler design are, this will help you optimise your operating conditions to suit that design. When assessing design factors, the primary question is whether the HRSG/boiler tubes and pipes' geometries and materials are suited to their flow profiles across the range of operating load cases. Operational factors are primarily concerned with assuring good control of water chemistry parameters (pH, dissolved oxygen or ORP, iron levels). At the 2014 ASME Power Conference in Baltimore, David Moelling of Tetra Engineering presented the recent research paper titled: Role of Boiling Mode and Rate in Formation of Waterside Deposits in Heat Recovery Steam Generator Evaporator Tubes, written by David Moelling and James Malloy. The paper discusses results from research in the theory of boiling mode and deposit formation, employing advanced thermal simulation of evaporation in real boiler models, and compares results with actual experiences in recent years.